When I was a young girl, my older sister bought me such a special gift, I have never forgotten it. Years ago, Avon carried a perfume fragrance called "Daisies Won't Tell". I remember how adorable the bottles were. My gift pack contained 3 bottles: bubble bath, spray cologne (or toilet water as it was called then) and hand lotion. Some of you may remember those cute bottles with their caps that had one big daisy embossed on the top. And oh, the fragrance! Light and summery, without all those spicy and strong grown-up notes. Over the years, I have tried to get this sweet fragrance again from Avon. It was perfect for summer, but mostly it was just an adorable gift to give a girl of any age. I would love to wear it now! For this birthday card, I was thinking of my younger sister who (like me) also loves flowers. I knew she would love a vase of white daisies. As girls, we used to find wild daisies in the field we crossed on the way to school. We'd pluck the petals off, one by one, saying that old familiar verse, "He loves me, he loves me not" for each petal plucked. There is just something innocent and real about a bunch of daisies. Making this card brought back a flood of fond memories for me. And for my sister Ruth who was the recipient, it made her smile each time she looked at it. So, daisies won't tell whether the object of your affection loves you in return, and daisies also won't tell how old a lady is. I like that about daisies. This was the first birthday card I made when I first got my Cricut, four-and-a-half years ago. For some reason, when I created my blog a couple of years later, I missed it completely. I'd like to share it with you now. 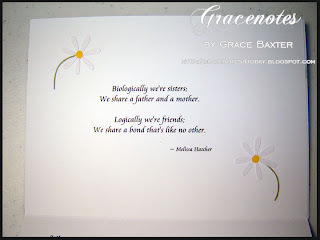 The card is 5-1/2" x 4-1/4" white cardstock, covered in daisy print CS that has embossed and shiny, sparkly accents. This was the inspiration for the whole design. 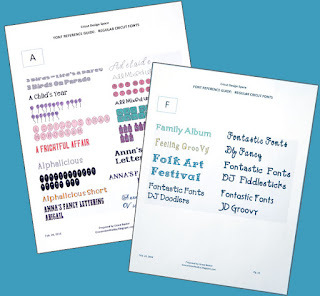 The "Happy Birthday" sentiment is from Beyond Birthdays cut from pearlescent blue CS. I'm guessing it was cut at about 1-1/2. I used Jasmine for each letter of the name. This was before Design Studio or the Gypsy were out so there was no way to weld the letters together. Again, I'm sorry I don't remember exact measurements. Of course the daisies and vase were cut using Walk In My Garden. The poem was prepared on my computer and printed onto the white cardstock before adding anything else to the front. There is also a personal message on the lower half of the inside. It's a simple little card, but sometimes those are the best. 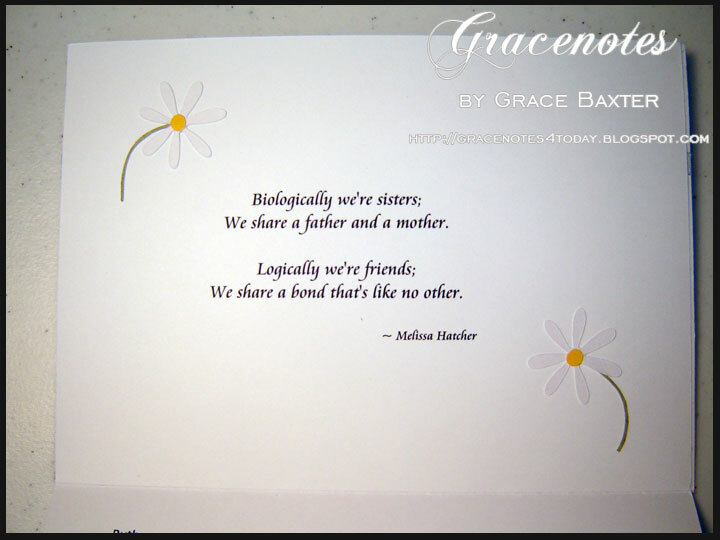 Good morning Grace....this is a pretty card....much prettier than the very 1st card I made using my Cricut ! Thanks for leaving some love on my blog!!! 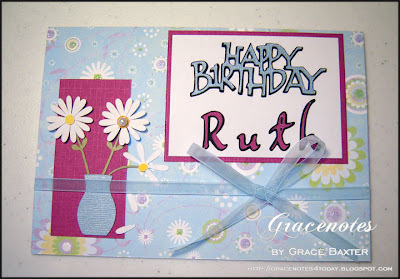 I have been using Picnik to create the fuzzy white backgrounds on my cards. It's a free service with limited effects or you can upgrade and pay for LOTS of cool effects. You might want to check it out! Thanks again for your sweet comments...I hope this info helps!! !